There’s always been something magical about wandering around a bookstore, never knowing what you might find. It’s often a wonderful place to stumble into unexpected surprises while discovering new worlds. Unfortunately, the number of bookstores across America has declined sharply in the past two decades, with only a few thousand remaining. But Jane Hanauer, the owner of the last bookstore in Laguna Beach, loves being in the business. Laguna Beach Books opened in 2006 and is located at the Old Pottery Shack. Despite the small size of the location, it is filled to the brim with a thoughtfully selected assortment of great reads. Have no idea what you’re looking for? The staff is known to leave cute notes with blurbs inside their favorite books. While the kids and young adult sections provide 40% of their sales, LBB is also well known for its fiction, non-fiction, travel, poetry, and art. 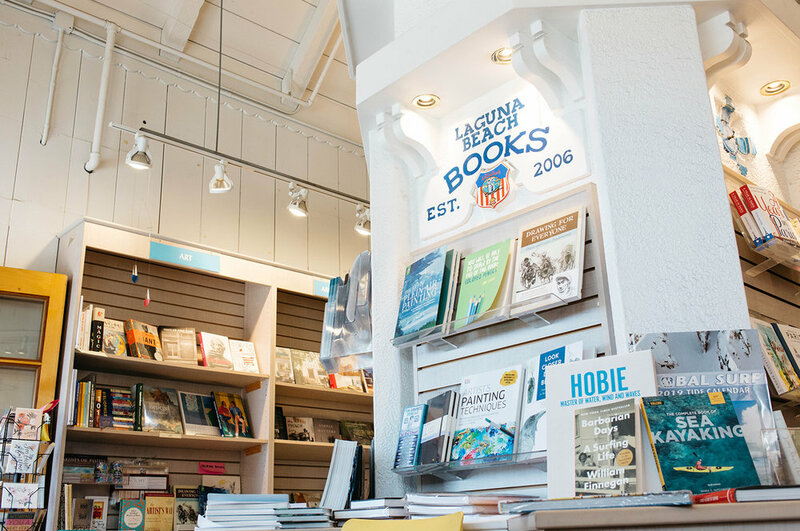 The bookstore takes great pride in Laguna Beach -- it is named after the city, after all -- and boasts a popular selection of books specifically written by Laguna Beach authors. In fact, Hanauer’s love of her town is evident in a special monument within her business. If you visit the store, you’ll be greeted with a floor-to-ceiling replica of the Laguna Beach Lifeguard Tower holding books, art supplies, and cute greeting cards on every side. It was a love of reading that inspired Hanauer to open shop, but the friendships she established with her employees and customers have kept her going through this turbulent time for print. Hanauer genuinely enjoys people and says, “Each of us who works here really loves to be here. We love coming to work.” Most of her employees have worked there for over 10 years -- which only seems to valorize the collective love of their workplace. “I don’t think anybody would start a bookstore who didn’t love to read,” laughs Hanauer. She certainly doesn’t mind the perks of receiving advance copies of books before they are released to the public to see if she’d like to sell them at her store. Hanauer is currently reading a staggering total of five books at once (#readinggoals). While Hanauer can’t afford to compete with big online companies like Amazon, she can offer a true human experience, something Alexa and other artificial technological constructs just can’t provide. Customers and employees enjoy chatting about books with one another so much that they’ve created a monthly book club for their regulars to get into deeper discussions. A goal and passion of Hanaeur is to bring big authors to town, but her store can only hold 70 people. So when Dean Koontz came to town, she partnered up with the Laguna Beach Playhouse. Together they recently co-hosted two events with Laguna Beach High School featuring Julie Lythcott-Haims’s book How to Raise an Adult. Laguna Beach Books is a community-serving business. It not only supplies the town and its tourists with incredible novels to read, but also specializes in hosting events across town that help bring Laguna residents closer together. We’re grateful that places like Laguna Beach Books still exist, and hope the last bookstore in town will remain in town, forever. LBB is open 7 days a week from 10am-8pm and everyone who works there is extremely helpful. Mari Verdugo is a fourth generation Laguna Beach native, a photographer, and writer. Find Mari at @marielenaphoto or on her website.